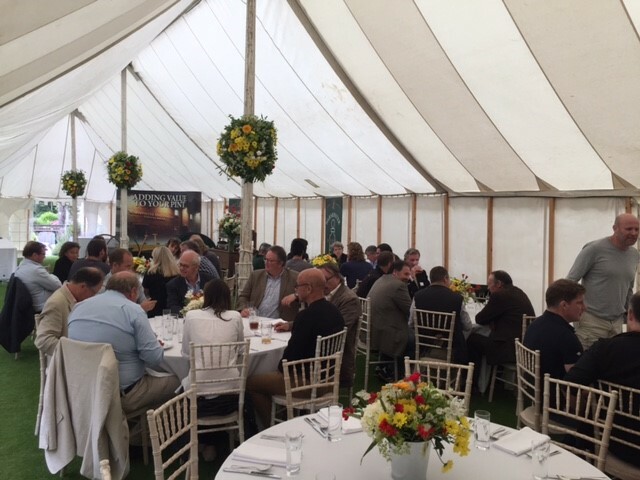 Once again, on June 26th, the marquee was erected on the lawn of the maltings garden in order to play host to customers and suppliers alike. 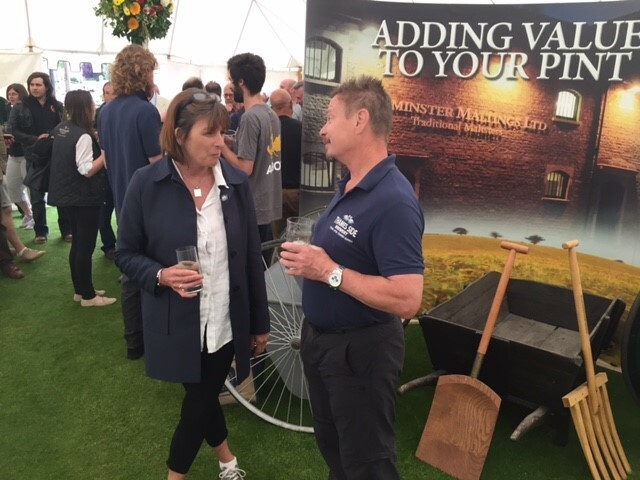 The theme to this year’s Open Days focused on “So what is new?” This applied to not just what is new at the maltings itself, but also new developments within the barley and malting industry as a whole. Warminster Maltings own contribution to this theme was, of course, our new Burner and heat exchanger installed in the kiln last August. Highlighted by Chris Garratt as the single biggest capital spend over the past 16 years, he also pointed out that this brand new bespoke installation has widened the range of malts that we can now offer our customers, as well as delivered sustainability into our production capacity going forward. 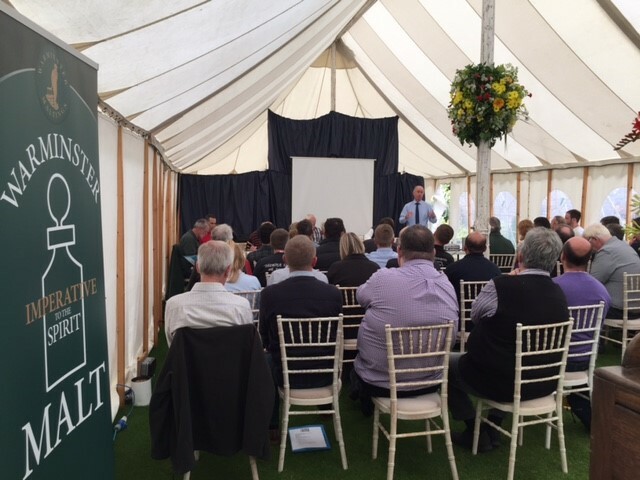 Within the wider barley supply industry, Robin Appel touched on some very topical and sensitive issues. For starters, glyphosate herbicide, widely used by farmers, particularly in Scotland, to ‘even up’ the ripening of barley crops prior to harvest. Last year, residues of glyphosate were detected in 8 of Germany’s most popular beers, and on the back of that Denmark, a prolific malting barley producer, has banned the chemical for use in the way described above. This not only suggests the beginning of a trend that British farmers will need to follow, already some brewers and maltsters have imposed a ban on the use of glyphosate on Maris Otter barley. Robin also touched on the subject of biosolids, now widely used by farmers as a valuable source of phosphate fertilizer. A new Quality Assurance scheme for biosolids, supported by all the Water Companies, has forthrightly addressed all the prejudices formerly voiced by the food and drinks industry, to the point, Robin joked, that common-all-garden farmyard manure appears less safe! 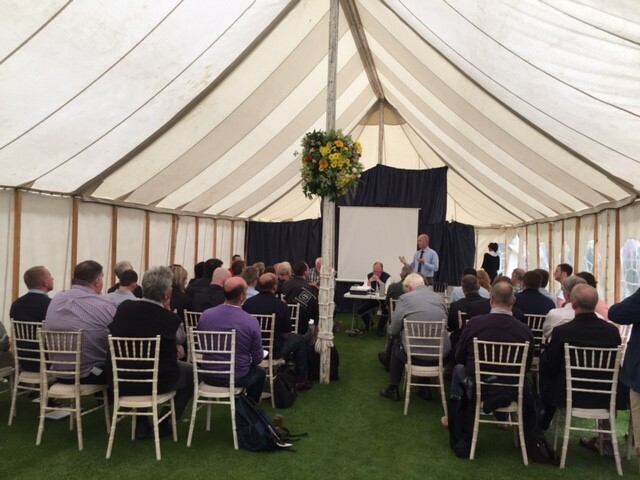 On Friday 30th June, SIBA South West held their quarterly meeting in the marquee to finally round off a very busy week of visitors. The meeting saw the change of Regional Chairman from Stephen Heptinstall of Cotleigh Brewery to Kevin Newbold of Flying Monk Brewery and a very comprehensive agenda was debated by a very lively gathering of members. The spirit of Craft Brewing continues to flourish.